For over 40 years Kenny Hill has been exploring the vast possibilities of classical guitar; as a guitar maker, as a player and even as a composer. He is best recognized for guitar making, first as an individual luthier, and over the past decades developing a larger team at Hill guitar Co., as well as developing the import brand New World Guitar through his ground breaking work in China. He is also a major contributing designer for Cordoba Guitars in their worldwide growth. He was born in San Jose California, and it was in Santa Barbara in the 1970s Hill began his self taught journey, starting out with strong-headed original designs, but very little source information to guide him, only books, a few players and his own ideas. His first direct guitar making influence and goad was John Gilbert. During the 1980s, as his family of four children were spawned, he took a hiatus from guitar building, though he continued to play actively as a performer the whole time. In 1989 he returned to guitar-making with a renewed affection, and at that time concentrated on building a series of copies of iconic, contrasting guitars; Torres, Fleta, Hauser, Rodriguez, Panormo and others. This research and practice gave him a new grounding in the knowledge of traditions in guitar design. In 1993 he received a 3 year grant to set up a guitar building shop in Soledad State Prison. This was the first time he had a crew of guitar makers to direct. It was a great opportunity to make more instruments and try many things. It turned out to be a very unusual study in management of people and learning, and an experience that indirectly led to the development of various workshops in California, in Mexico and in China. 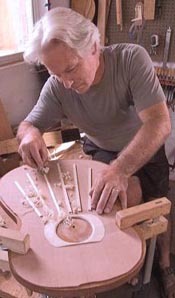 During the 90s, through working with those venerable historic guitar designs, and also working in far flung cultural environments, he evolved his own guitar designs, eventually known as his Signature and Performance models, while concurrently developing the business experience and vision to grow beyond being an individual luthier, and into the entrepreneurial development of various lines that have expanded the capacities of the concert classical guitar, and have raised the everyday standards of commercial grade classical guitars as well. This has all been done while maintaining a active musical life — playing, performing, learning music, music by friends and colleagues and more of his own composition. He emphasizes the usefulness of musicianship as the key to staying in love with the instrument and staying in touch with the needs of the players, as well as sharing the gift that only music can bring to the world. His home workshop is in Ben Lomond, in the mountains near Santa Cruz California. It’s a sweet workshop in a sweet place, with workers who have been with him for many years, building and refining Signature and Performance guitars by hand, as he has for 40 years. He also continues to be a founding shareholder of the factory in Guangzhou China where New World Guitars are made under his close supervision. After 4 decades in the field Kenny Hill continues to be fascinated with the instrument, the music, the people and the world of classical guitar. His attitudes and hopes are focused on the future, new players, new music, new capacities of the instrument and the view that, from where he stands, we are still only just beginning.